The large surface table (1220 x 220mm) can accommodate cylinder heads and blocks up to those used on moderately sized commercial vehicles including truck and plant engines. The cutting head to table depth of 700mm and table traverse of 1300mm means that even the tallest cylinder blocks and longest heads can be machined. 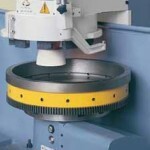 The cutting wheel diameter of 350mm ensures that even the widest of jobs can be machined in a single pass. 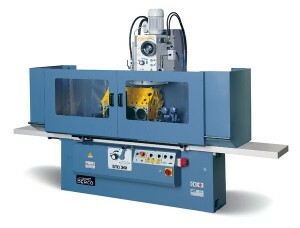 During machining operations, the cutting head spindle mounted within the vertical column is fitted with either the grinding wheel or additional fly-cutting attachment. Once set with a job, cutting action is achieved by moving the vertical column down the required amount via the graduated in-feed wheel. The table feed then moves the job under the cutting wheel to achieve the cut. The spindle has the option of three speed settings and the hydraulically operated surface table feed rate can be infinitely varied to ensure the optimum speed/feed rate for the job in hand. As the surface table is hydraulically powered the table movement is totally stepless enabling the machine to achieve very fine surface finishes which are especially important when using the latest multi layer steel and shim type head gaskets. Although designed primarily for the refacing of cylinder heads and blocks, the machine can also be used to machine various components including flywheels and manifolds as well as being utilised for many other non automotive engineering jobs. The availability of both grinding and milling/fly-cutting options means that a wide range of materials can be machined. The grinding wheel is spindle mounted beneath the vertical column and is made up of a series of segmented grinding stones arranged around the wheel circumference. These stones are available in a variety of grades selected according the specification of the material being machined. H T Howard has two of these segmented wheels fitted with the most commonly used stones enabling reduced set up times between jobs of different materials. Each grinding wheel is balanced to remove vibrations during the machining operation which would affect the surface finish of the final work. When the grinding mode is used, there is an additional pump which delivers coolant to keep the work piece cool and grindstones free of contaminants. Since the introduction of modern cutters (which enable many materials to be machined that would previously required grinding), the grinding facility is now mostly used only when we have cylinder heads which contain a mix of both very hard and soft materials. Primarily, this means diesel cylinder heads made of alloy or iron but also containing extremely hard diesel pre-combustion chambers. When this mix is encountered our experience shows that grinding offers the best compromise of machining capability and surface finish. The grinding mode is also used when machining flywheels in conjunction with the rotary table attachment. When milling / fly-cutting operations are required the job is generally machined “dry” (sometimes with the addition of a little manually applied cutting oil). H T Howard utilise a range of round button type inserts mounted in a single tool holder. This is fitted into the wheel head but protrudes lower than the grind stones. To maintain wheel balance, a dummy holder of exactly the same weight is fitted directly opposite the main tool. Each button insert is selected depending on the material to be machined. For purely aluminium machining a single carbide insert with a PCD coating on one side is used. For aluminium containing cast iron (liners in blocks or soft pre-chambers in heads etc), a single sided CBN insert is used. Our powered Rotary Table attachment is an optional extra for the Berco ST361 and can be mounted onto the surface table of that machine. The power feed is taken directly from the ST361 enabling operation of both machine and rotary table from the same control panel. Once mounted and connected, the powerful rotary table can be used in conjunction with the large grinding wheel or additional flared cup wheel for refacing flywheels and other components of that type.